Things take time. 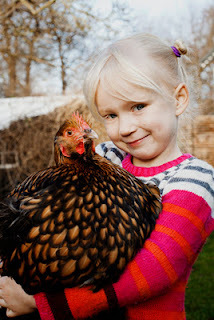 In early summer we became the proud owners of four chickens. What with the construction of a hen house and all sorts of other chicken chores to be done it took a while before we were ready to welcome them home. It has been a continuous learning process since we did, primarily learning to remember to close them in at night. 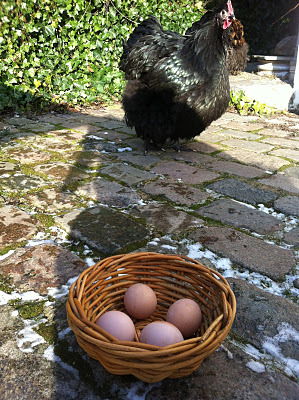 I was unfortunately woken one night by the hens shrieking, thery had been joined by a fox. Tragically the fox got one while I ran desperately around the garden trying to find out what was happening. A few weeks ago we faced another incident. The chickens run freely around the garden each day, happy to explore their surroundings. This time following a visit from our postman who forgot to shut the gate behind him, the hens were free to explore even further afield and we lost our second. We contacted animal protection but had no results - imagine how surprised we were when it returned voluntarily a week later. A few days later came the first egg. Hooray for Winnie, Gunna and Lisbeth! There is still a long way to go before we are self-sufficient - but we heading further and further in the right direction. What's in the boxes, Nanna?